For several months, newborn infants have been found in trash dumpsters around New York City’s five boroughs. Is it mere coincidence…? A sinister, deeper pattern…? And if it happens to be either case, why are Watson and Holmes the only ones to realize it’s even happening in the first place? 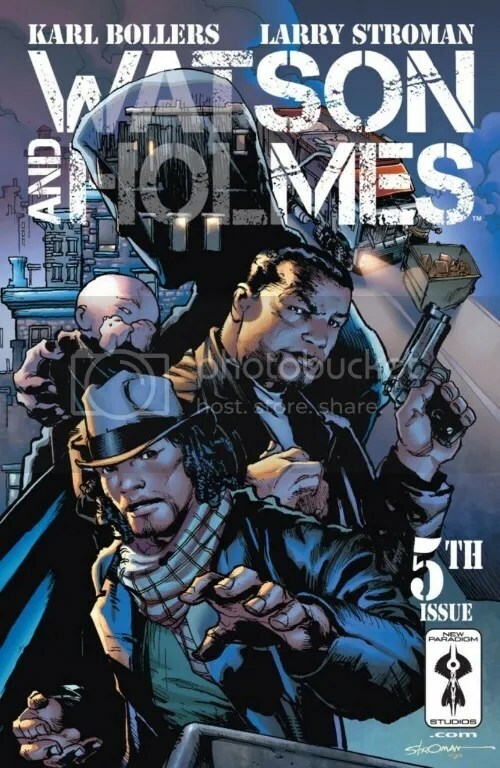 Don’t miss the latest installment in the saga of Watson And Holmes. Writer Karl Bollers returns for this single-issue story, the roots of which were introduced in the original ark of the series (see my reviews here, here, here, and here), it is instantly accessible for any new readers. On top of the main story, Bollers also gives us plenty of scenes to flesh out the characters, in this issue in particular we get more insight into Watson’s life. We see him spending time with his young son Omare, who seems a bit wiser than his years, and interacting with his wife Marie, from whom he is separated (a situation which neither Omare or Watson is too happy about). The Baker Street Irregulars also make a return appearance here, helping Watson move into Holmes’ apartment. And, most excitedly for me and I’m sure longtime Sherlock Holmes fans, the name MORIARITY is briefly mentioned. But I won’t say in what context. You have to buy this issue yourself. And you should, because it’s awesome. The guest artist on this issue is the one and only Larry Stroman, who does an excellent job filling in for regular artist Rick Leornadi. While Stroman’s unique style is noticeably different from Leornadi, he manages to capture to the tone of the story just as well, so it’s not a jarring change at all. WHile I hope for Leornadi’s continued work on this title, if they HAVE to schedule a fill-in artist once and while, you certainly can’t go wrong calling on Mr. And having enjoyed his artwork from way back in X-Factor (& Tribes! ), you can see that no only has he not missed a step, but I believe he has just gotten better over the years.